"Gogy told me that they had brought portions of a monkey (in the native language "colo"), but they had cut it in pieces, and the head, which I should have liked to secure, had disappeared. I could only get two feet through an exchange which Gogy made for two spears and one tomahawk. I sent these two feet to the Governor in a bottle of spirits." In November 1802, Governor Philip King sent an exploratory expedition west of Sydney under the command of Ensign Francis Barrallier, a French ex-pat who had taken service with the British after fleeing France with his parents following the French revolution. As well as finding a passage across the mountains that barred Sydney from the interior, Barrallier was trying to find the seat of a figure that Governor King later referred to in letters as the 'King of the Mountains'. Who exactly this King of the Mountains was supposed to be is unclear. Many have thought he was supposed to be some sort of overlord of the local Aboriginals. David Levell, in his 2008 book Tour to Hell, argues the King of the Mountains to have been the head of a secret inland settlement that many of the convicts imprisoned in Sydney believed would offer sanctuary to any who escaped there. Barrallier returned to Sydney in late December, having failed to locate either passage or king (the one would be discovered later, the other would prove to be mythical under any interpretation). Barralier's journal of his expedition languished in relative obscurity until an English translation was published in 1897. The main interest for later readers of Barrallier's account has been in his dealings with the indigenous people he encountered and worked with. Barrallier had an interest in developing a rapport with the local people he met that was not shared by most of his British associates and his notes, sparse as they may be, provide one of the few direct records available of pre-colonial life in the Sydney region. I've brought Barrallier into this post, however, because of an incident he describes briefly in his journal where the game procured by some of Barrallier's aboriginal associates included an animal that Barrallier refers to as a 'monkey'. Barrallier did not see the animal's remains before it had already been butchered, but he is still the first European known to have acquired a specimen of one of Australia's most iconic animals: the koala. Koalas Phascolarctos cinereus, photographed by Dinkum. Koalas are widespread in the east of Australia, though loss of habitat has rendered their distribution localised in some areas. To most people outside Australia, the koala seems like a plush toy come to life, the essence of cuteness manifest in a single animal. The Australians themselves often have a more ambivalent attitude: while the koala is certainly a high-ranking member of the pantheon of the Australian fauna, together with such luminaries as the kangaroo, the platypus, the kookaburra and the gumnut baby, Australians also tend to look upon it as indolent, bad-tempered, and steeped in the kind of aroma that only an exclusive diet of eucalyptus leaves can give an animal (many Australians look more affectionately on the koala's closest living cousin, the wombat). To zoologists, Phascolarctos cinereus is the only surviving species of a lineage that goes back at least to the late Oligocene. Three subspecies of koala have been recognised, but these probably represent clinal variations rather than geographically discrete units (Houlden et al. 1999). At just what point koalas became eucalyptus specialists is something we don't know for sure. The late Oligocene Perikoala palankarinnica possesses an ankylosed lower jaw (i.e. one that has the two sides fused together at the front) that may indicate a diet of tough leaves (Long et al 2002). Eucalyptus would be at least one candidate for such a diet. However, Perikoala's rough contemporary, Madakoala, lacked such a fused jaw and may have taken softer browse. Nor is a fused lower jaw present in the Miocene genera Litokoala or Nimiokoala (Louys et al. 2009). It seems likely that specialisation on Euclayptus may only have developed with the modern genus Phascolarctos, corresponding with the rise of eucalypt dominance in the Australian flora in the late Miocene. As well as being potentially less specialised, the fossil genera of koalas were also distinctly smaller than the living species. Koala evolution reached an apogee of sorts in the Pliocene and Pleistocene with the fossil species Phascolarctos yorkensis, which tipped the scales at nearly twice the size of P. cinereus (Long et al. 2002) (somewhat disappointingly, no-one seems to seen fit to present a fossil koala with the name of Katastaxarctos). Koalas can be very vocal animals, using bellows and grunts as their main method of communicating. This video of a vocalising bull comes from here. The specialisation of the modern koala is truly a remarkable thing. True exclusivity of diet seems to be a rarity among large terrestrial vertebrates (and as it can reach sizes of 20 kg, there is no denying that the koala is a large vertebrate). Many have their preferred delicacies but remain far from averse to the occasional variation (something that I really wish the ABC had been more aware of with that lorikeet article). Thus we have cattle gnawing on bones, cats eating grass, or deer killing and eating birds. Even the giant panda, perhaps the other specialist mammal most familiar to the general public, has been known to supplement its bamboo diet with roots and small animals. But the koala turns up its nose at almost anything other than Eucalyptus leaves—and usually only a small number of Eucalyptus species at that. 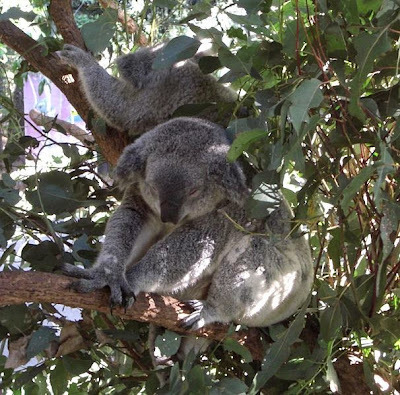 The toughness of Eucalyptus leaves mean they require a great deal of digestive processing, and the small nutritive return is responsible for the extended periods of inactivity that koalas are known for. Early British naturalists often compared the koala to the South American sloth, which functions under similar constraints. The low nutrition of their diet is also reflected in the notoriously small brains of koalas, which have one of the smallest brains relative to body size of any mammal. 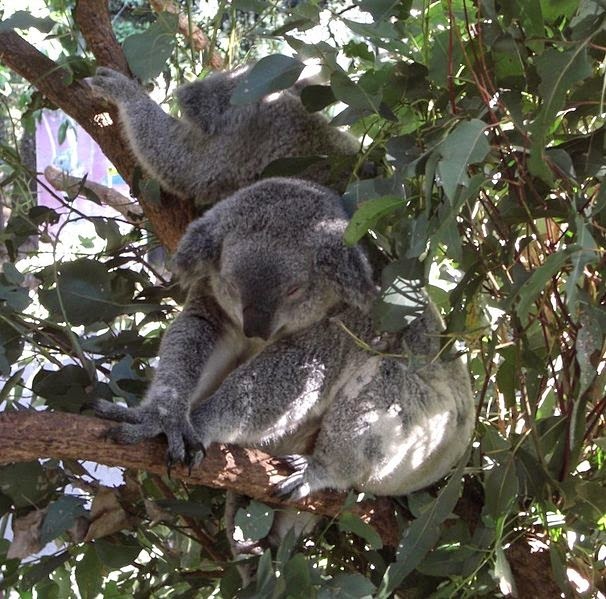 So noxious is the eucalypt diet that koala joeys have to be weaned onto it through stages. When a joey is about six months old, its mother starts producing a faecal pap of half-digested leaves that the joey eats direct from her cloaca before moving to a more direct leaf diet about a month later. Nevertheless, by specialising on Eucalyptus leaves, koalas have access to an abundant food source that few other mammals can handle. Even after the arrival of Europeans, koalas have handled the incursion of foreign predators better than many other Australian natives. The main threat to their continued existence is clearing of the forests on which they depend for food. The koala deserves its position as an icon, and an icon is worthy of respect. Video of a koala joey feeding on pap, from Arkive. Houlden, B. A., B. H. Costello, D. Sharkey, E. V. Fowler, A. Melzer, W. Ellis, F. Carrick, P. R. Baverstock & M. S. Elphinstone. 1999. Phylogeographic differentiation in the mitochondrial control region in the koala, Phascolarctos cinereus (Goldfuss 1817). Molecular Ecology 8 (6): 999–1011. Long, J., M. Archer, T. Flannery & S. Hand. 2002. Prehistoric Mammals of Australia and New Guinea: One Hundred Million Years of Evolution. University of New South Wales Press: Sydney. Louys, J., K. Aplin, R. M. D. Beck & M. Archer. 2009. Cranial anatomy of Oligo-Miocene koalas (Diprotodontia: Phascolarctidae): stages in the evolution of an extreme leaf-eating specialization. Journal of Vertebrate Paleontology 29 (4): 981–992. Would Barrallier's "colo" be cognate with modern "koala"? I think so. According to Wikipedia, the original Dharug word is 'gula'. I don't know if the men Barrallier was told the word by were speaking Dharug or not, but 'colo' doesn't seem too far from 'gula'. The change of the -oo sound to an -oa was apparently an error on the part of British authors that stuck. The earliest name recorded for koalas by a British author was apparently 'cullawine', which I personally think has a nice ring to it. Thanks. I learn from Wiktionary that another early colonial name as "native monkey", so Barrallier apparently wasn't alone in thinking the animal a monkey. Considering that Barrallier never saw the head of the 'colo', it'd not surprising that he didn't make the bear comparison that is more common today. And as koalas come down to ground level very rarely, most colonials would have probably still only known them as indistinct animals moving in the canopy. "Three subspecies of koala have been recognised, but these probably represent clinal variations rather than geographically discrete units (Houlden et al. 1999)." Any hope of you reviewing that book here at CoO? I'd need to get my hand on a copy first. Anyone willing to send me one?